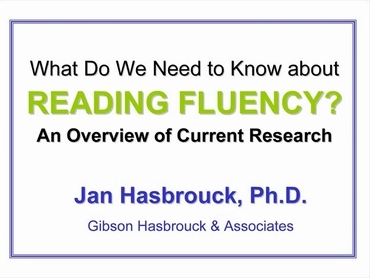 How To :: Webcast Video: What we need to know about reading fluency :: Read Naturally, Inc.
Jan Hasbrouck, Ph.D., presents an overview of reading fluency, including a definition of fluency and current research on the importance of fluency, how to assess fluency, and how to teach fluency. Having trouble playing this video? How fluent should students be (oral reading fluency norms)?